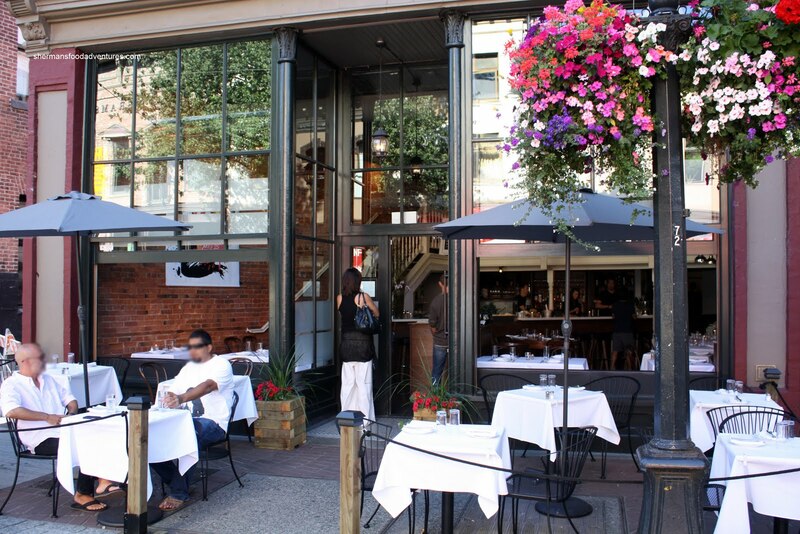 Located across the street from The Irish Heather on Carrall Street, Cork & Fin is situated in what is fast becoming the hub of activity in Gastown. Places like Chill Winston, Terracotta, Six Acres, Judas Goat, Salt, Cobre, L'Abattoir and Alibi Room are all nearby. With outdoor seating and nearly outdoor seating along the front, we really couldn't have picked a better day to dine here. Fresh air, great lighting for my pictures and random yelling from the locals (it borders the Downtown Eastside), it was truly the Gastown experience. Since the menu is all about the small plates, we ordered a bunch of items to share. Well, the first item wasn't exactly small though. We went for their Large Seafood Tower. With a bevy of seafood laid out on 2 tiers (with the 3rd being mostly condiments), the darn thing looked impressive. We were treated to fresh prawns, clams, mussels, oysters and crab legs. I found that most of the items were perfectly cooked, especially the crab which was meaty and fluffy. The prawns were slightly more cooked than we would've liked. Lime and lemon wedges with house-made cocktail sauce, red wine vinaigrette and a cucumber sunomono rounded out the platter. For $55.00, I think the tower is a pretty good deal considering that Blue Water and Joe Fortes charge much more. It's true that the one here is smaller; but in terms of what you get for the price, it's well-priced. 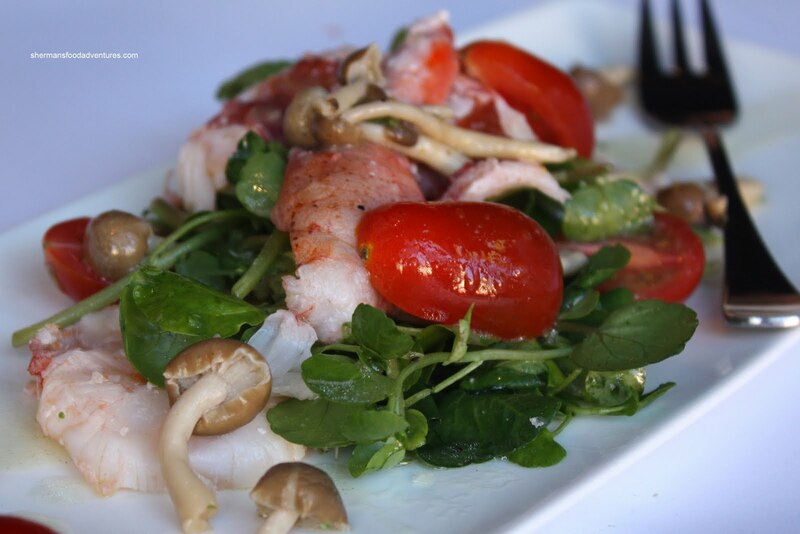 While we were listening to our server explain the daily features, I heard Lobster Salad and that was enough, it was as good as ordered. And I'm glad we did since there was a good amount of lobster for the $12.00 we paid. The lobster had the slightly chewy texture we were looking for and the sweetness too. The pickled shimeji mushrooms were very potent; but combined with all the ingredients it worked. I only wished they eased up on the salt. 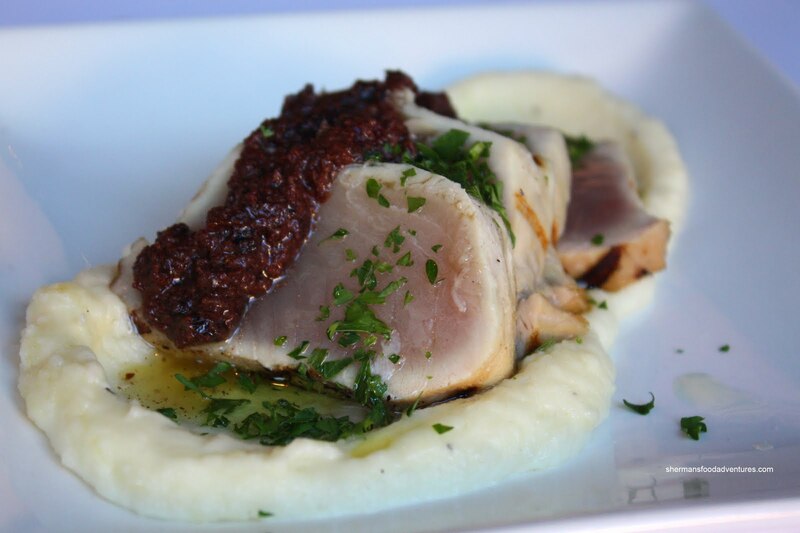 Our Tuna Steak seemed more like thick pieces of tuna tataki than anything else. However, it was perfectly cooked and the accompanying tapenade was surprisingly subtle. This way, it didn't overwhelm the delicate tuna; rather it provided only a understated salt compliment. 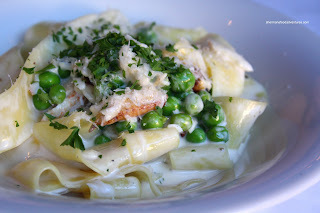 Next up was the Crab Pappardelle with peas and crème fraîche. If there was ever an example of being over al dente, this would be it. It was very chewy; but you know what, I personally like it. I can see how some wouldn't. To get it this al dente, dried pasta would've been used. I have no problem with that since I prefer it. As for the dish itself, the sauce was very understated. That allowed the ample pieces of crab to be the star. And the natural salty sweetness is all the pasta needed. 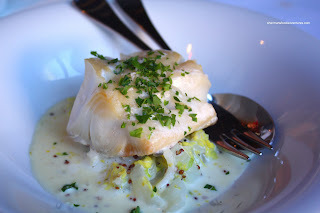 Staying with seafood (since this is their specialty, although I was tempted to order the lamb...), we got the Sablefish poached in milk and grainy mustard. Yet another delicately flavoured dish. With the natural sweetness of Napa cabbage and a slight tartness from the mustard, we could still taste the fish (which is good since sablefish is quite mild tasting). We also got a couple of sides to round out our meal. The Crab Mashed Potatoes were pretty good in my books. 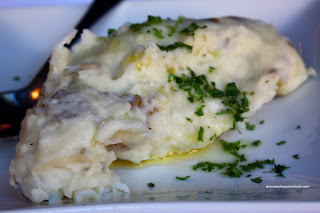 I could really tell that there was a generous amount of butter in the potatoes (so darn creamy). Furthermore, lemon butter was drizzled all over it too. Heaven. You can't see it in the picture; but there was plenty of crab meat as well. I really liked this. 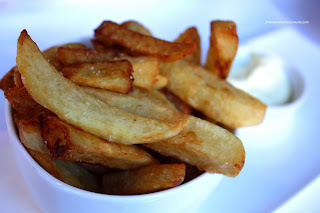 Lastly, we got an order of the Pomme Frites with aioli. I'm sorry to say this was an epic fail. The fries were cut quite thick resulting in a soggy product. They were not crispy at all. Yet, this was probably the only major hiccup in an otherwise very pleasant meal. I liked how they didn't use seasoning to hide the natural flavours of the seafood. Moreover, I felt that the prices were quite reasonable for what we got (especially with the LGFD discount too!). Combined with good service, I can honestly say that I'm planning a return visit. Yum! 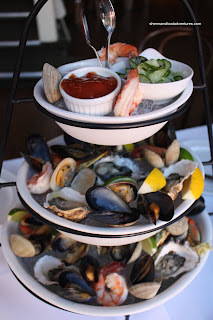 I was quite envious of the other table sharing the Seafood Tower - it looked amazing! Too bad we weren't there on the same night - I could have weasled into your party! Jenn, you had quite the meal there! Definitely would go back!